But exporting, opening, save as pdf.....isnt there a nicer way?? Oh yeah, certainly. It's very easy. Then, follow the steps below. Now you won't be able to do multiple sizes at once. Then again I've never tried digging into this either. #5 is where you choose it to be separate files, or one massive file. Use the setup in PDFCreator to suppress the dialog box that pops up for each sheet. When you have multiple PDF's being made, this gets really annoying and fast. This way it'll just default to whatever directory and bam, all done. Use a utility like Bulk Rename Utility to rename the files in a batch process (removing prefixes, etc). Thanx, but thats not exactly what im looking for. Like you said, iit would be so much more efficient to send say 40 drawings at once to f.i. a PDF plotter, without having to worry about anything. In the link they use "choose paer source by paper size"...that would by such a great thing to have. 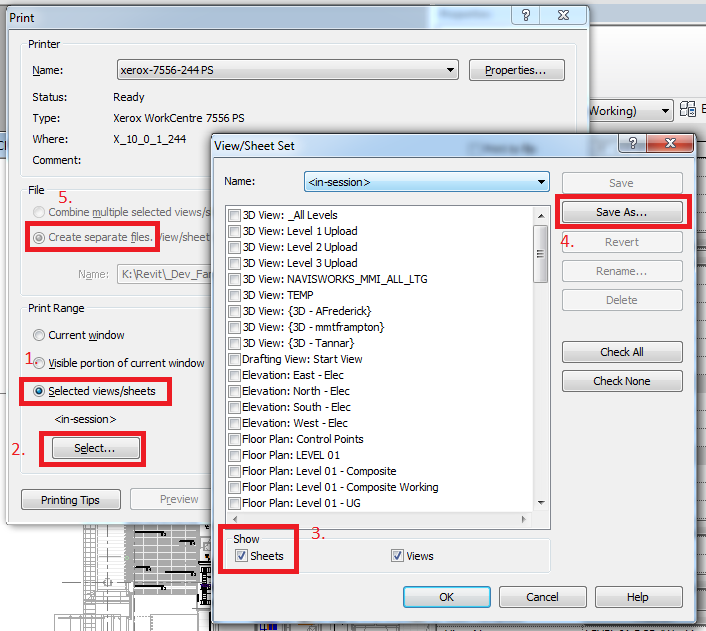 You do not have this option in Revit that I know of, so the workaround is all you have unfortunately.